Further adventures for twins Andy and Kim (A Little Trouble in Amsterdam, Level 2). 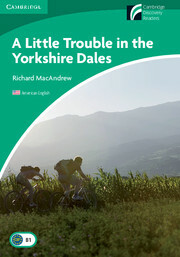 This time Andy and Kim, are away with their father in the beautiful Yorkshire Dales in the UK. After discovering a locked door in a supposedly abandoned mine, Kim's curiosity is aroused. What is someone hiding in the mine? And who is the man watching them through the binoculars?